Transitional phenomena play an important role in hypersonic flows for applications encompassing reentry vehicles, scramjets, tactical and ballistic missiles, and interceptor missiles with divert jets. The marked differences in skin friction and heat transfer for flows that are fully laminar, fully turbulent, or transitional can have a profound impact on design characteristics and vehicle performance. 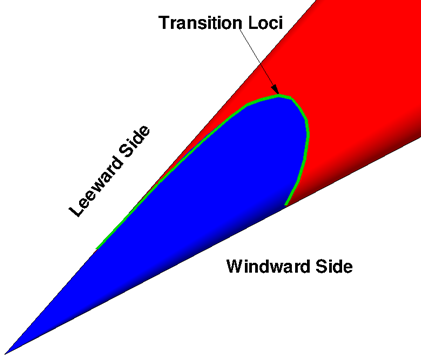 Transition onset line for Mach 6 sharp cone at 5 deg. angle of attack. CRAFT Tech has developed a transition modeling approach utilizing traditional transport type equations for predicting transition onset and transition to turbulence. 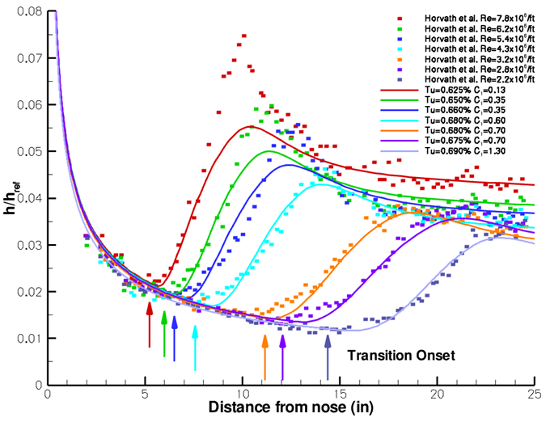 The transition onset model is based on fundamental disturbance theory and is sensitive to free stream disturbance (noise) levels as well as body geometry (nose bluntness) and thermal effects (wall temperature). 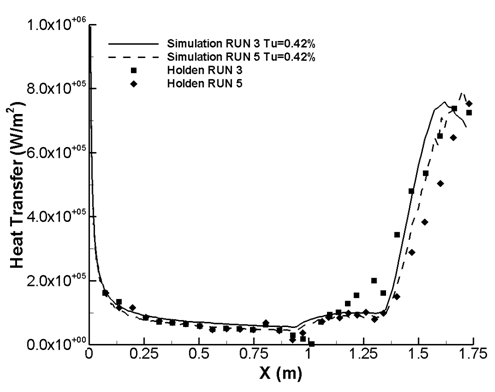 The transition to turbulence model predicts the evolution of turbulent intermittency as a three-dimensional phenomenon, automatically determining transition length based on onset conditions and evolving flow features. It is sensitive to freestream noise levels, thermal conditions, but more importantly, it can predict the familiar transition overshoot phenomenon. Together, the models can predict three-dimensional transition for supersonic inlets, lifting bodies, asymmetrical flows, etc. Comparison of predicted heat-transfer rate with our onset transport model with experimental data. Calibrated Engineering Transitional Model (ETM) results (solid lines) compared to 5 deg. Mach 6 cone test data.